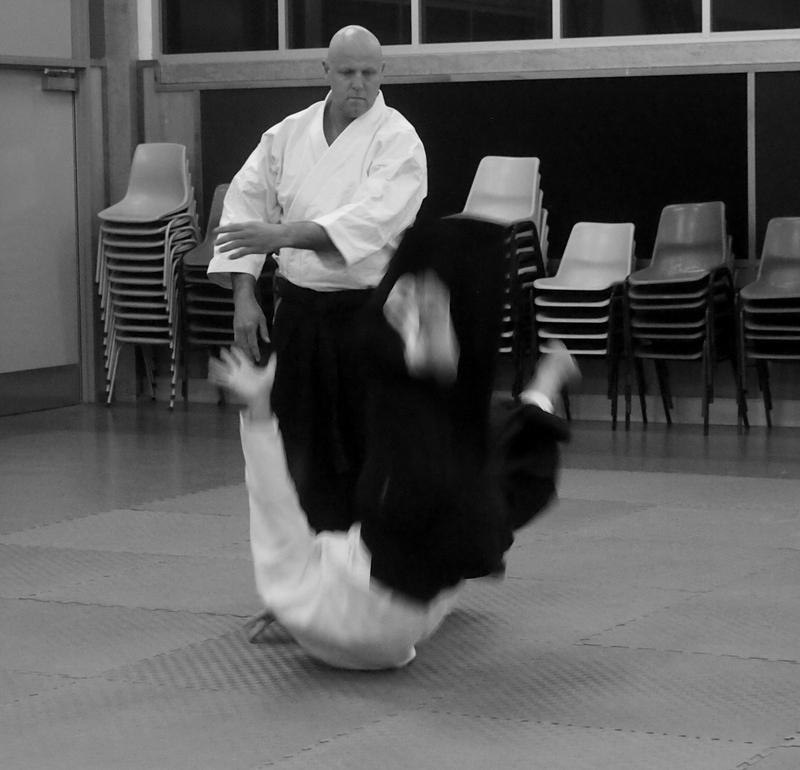 Some video of the “breakfall basics” class held at the dojo on 11 July 2015. Big thanks to our dojo seniors Matt, Neil, Peter and Jeremy for their assistance in teaching and ensuring practice was safe. See below a short video taken at the dojo where we explored munetsuki irimi nage as illustrated in O’Sensei‘s 1938 text “Budo“. 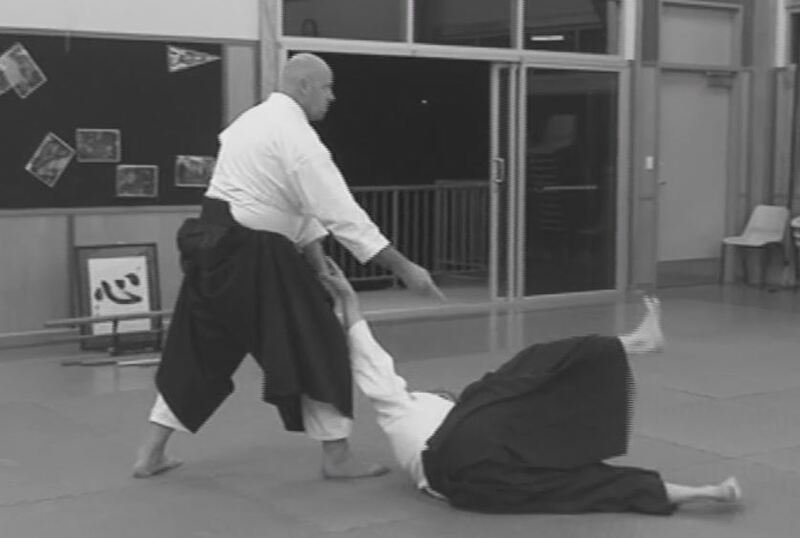 Although difficult to see in the below photo demonstrations featuring O’Sensei, a key technical aspect of the technique is the placement of the nage’s hand on the upper part of the uke’s shoulder. As the technique is executed, this hand eventually ends up immediately below the nage’s armpit. Relaxed and centred execution of the technique is essential to avoid any clash and achieve the necessary off-balancing of the uke. For the uke, receiving the technique feels a bit like hitting a “wall of feathers”. As you would have noticed in the video, we also played with adding extra atemi. It makes receiving the ukemi a bit more challenging in terms of uke sensitivity but is well worth the experiment. Big thanks to dojo senior Peter Marendy for joining me in the demo and to Eden for filming it. In the below videos Morihiro Saito Sensei (1928-2002) provides instruction on the traditional version of munetsuki irimi nage as practised by O’Sensei (the Founder of Aikido) in the immediate post-war period of his life. Notably the method of execution is the same as that outlined in the “Budo” text. Saito Sensei spent his teaching life dedicated to preserving the technical style of Aikido as practised and shown to him by O’sensei in the post-war period. Without his commitment to preserving the Aikido of the Founder and extensive efforts to record and document his teachings, much of the Aikido of O’sensei would have been lost. It’s a new year and time to move forward and onward. For many of us 2014 certainly had its challenging moments. For me it was health issues, for others it was injuries, work pressures, and in some cases, life just not going the direction it was supposed to. One great thing about training, however, is that for the time you are at the dojo it’s a chance to leave the world and all its problems at the front door. There were lots of highs during the year – successful gradings, opportunities to attend seminars, the privilege of teachers and seniors from other schools joining us in our training and most importantly enjoying each others’ company. Before we say goodbye to 2014, I thought we could take one last look at some of the moments that helped define it at the dojo. Here’s looking forward to training in 2015 (we start on Wednesday 7 January). Congratulations to Chelsea, Tom and Alastair on their 5th Kyu gradings on Saturday. Also, to Zac for his 4th Kyu grading from last week. Well done guys – it was an honour to be on your grading panel. Also, a big thank you to all the ukes and Matt Sensei for joining me on the panel. When it comes to milestones in an Aikido practioner’s journey, one’s shodan grading is no doubt one of them. This Saturday, two of our founding dojo members Brendan and Matt stepped up to test for this major achievement. They both performed excellent gradings and exhibited skills more than equal to the task. It was a absolute privilege and honour to sit on their grading panel. Congratulations to both Brendan and Matt and also to all the ukes that assisted and demonstrated such fine ukemi skills. Also a big thank you to Eden for taking photographs and producing the below slideshow. While in town for the upcoming Brisbane Aikido Yuishinkai seminar this weekend, our Chief Instructor Peter Kelly Sensei dropped in to the dojo to take our Thursday night class. To say his teachings were most insightful would be an understatement. I’ve heard the statement sometimes said that Aikido techniques can be divided into 2 categories – “those for go and those for show”. Peter’s motto is more like there are 2 types of techniques – “those for go and those you haven’t figured out yet”. Anyone with any doubts that Aikido is a powerful and most effective martial art would certainly have had them wiped away on Thursday night. Strong centred attacks were the name of the game. Full kuzushi on contact using traditional sword based movements, a heaven-man-earth body structure and applied yin-yang principles was how it was played. Loved every minute of it! Big thanks to Peter Sensei for taking the time out of his busy schedule to visit us. As is typically the case, we had a camera and took some photos. Looking forward to attending this weekend’s seminar.